Chicken Cream Cheese Enchiladas are a wonderful dinner for the weeknight. These enchiladas are perfect when you have some leftover cooked chicken. These are a creamy enchilada that isn’t too spicy, and these enchiladas reheat very well. Who doesn’t love Tex Mex? I think so many of us love Tex Mex, you don’t have to live south of the border to make this main dish up. These chicken enchiladas with cream cheese will be perfect for your dinner. You can make these up in very little time, and they taste great. Better yet, they even reheat well, so if you need to make a meal ahead, this may be the perfect choice for you. No matter if you like red or even green enchilada sauce we have you covered with this recipe. 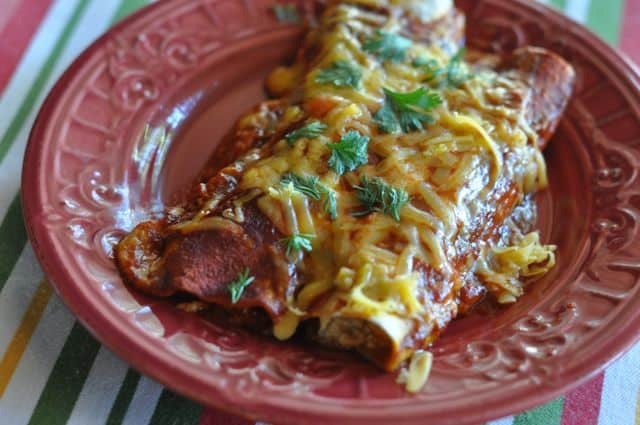 These enchiladas are super easy to prepare, and since they are mild they are perfect for people who do not like food that is too spicy. This enchilada recipe is family friendly. You can serve this with some refried beans or even some Mexican rice for a full meal. Looking for more Enchilada Goodness? Try some of these recipes! These Chicken Cream Cheese Enchiladas are a great way to enjoy chicken. De-bone chicken, and shred chicken into small pieces, if you don't have a rotisserie chicken you can use 3 to 4 cooked chicken breasts. In a large skillet, combine chicken, cream cheese cubes, sour cream, chilies, chopped onion, seasonings, and 3/4 cup cheddar cheese. Heat until the cheeses are completely melted. Coat baking pan with cooking spray. Scoop a heaping spoonful of chicken mixture onto tortilla, roll, and place into pan with seam side down, repeat until all of the filling is used. Pour enchilada sauce over the rolled tortillas. Sprinkle remaining cheese on top of enchiladas and bake at 350 uncovered for 20-25 minutes. Thanks to Julie Doellingen for the inspiration of this recipe. Never made enchiladas before. My daughter loves Stouffers version. Well I found your recipe and decided to make my own. I cooked my chicken breasts in the crock pot with a can of Mexican tomatoes and taco seasoning. Then followed your recipe with the cream cheese, sour cream, cheese. Etc. It was the biggest hit in a super long time. Thanks. Sorry I didn’t follow along to a tee. I think my chicken mixture came close to yours. I’m just stunned at how good it was. Plus my husband will eat anything I serve but when he says twice how good it is then I know he likes it. I am so glad you enjoyed this recipe. I love it when my family loves something I make. I am so happy your family enjoyed this recipe. I love it when you make the whole family happy. Got short on time after I started filler so layered it as a casserole w/ tortillas. Guys are raving over it. Even asked where I found it. That’s a great idea! I love time saving steps. Very tasty! The only change was to leave the chicken in chunks. I didn’t shred it. Also i didn’t heat the filling in a skillet first. I covered it with foil and baked for 45 min. That was enough to make the cheese melty. Delicious! I love the changes that you made. Do you think you can reheat the leftovers given that it has cream cheese? I did reheat them, were they just as good as the first time, not quite, still tasty though. Thank you for the response and the leftover’s were very good. I love reading your blog. Really great recipes and the Chicken Cream Cheese Enchiladas look delicious. I live in New York City and recently started my own cooking blog called “Cookin’ with the Kaptain” – I’m new to cooking and would love to hear what you think about my blog! Wow, that sounds really cheesy! Perfect. Easy to prepare and my wife and kids loved it!!! Thank you, Stephanie!! I am the new hero of the kitchen. I am glad that recipe turned out well for you! Those were some pretty tasty enchiladas. LOVE the new design and this recipe is calling my name! !